Alisma subcordatum, plant. Dan Busmeyer, Illinois Natural History Survey. Illinois Plan Information Network. wwx.inhs.illinois.edu (Accessed 7/2017). 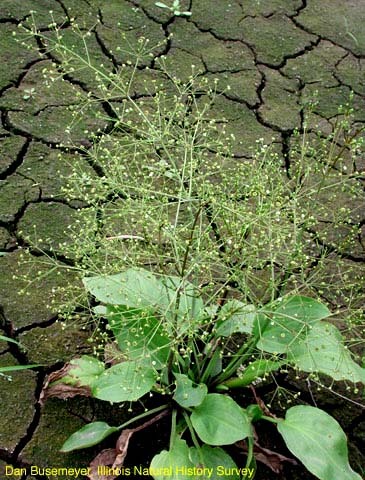 Alisma subcordatum is a perennial monocotyledon herb, colonial from rhizomes rooted in mud, flower stem triangular. Alisma subcordatum leaves. ©2006 Jeffrey Pippen. 060907-5088butnerz. jeffpippen.com (Accessed 7/2017). Leaves alternate, elliptic 3-18 cm long, 2-12 cm wide, secondary veins conspicuous, almost parallel to midrib. 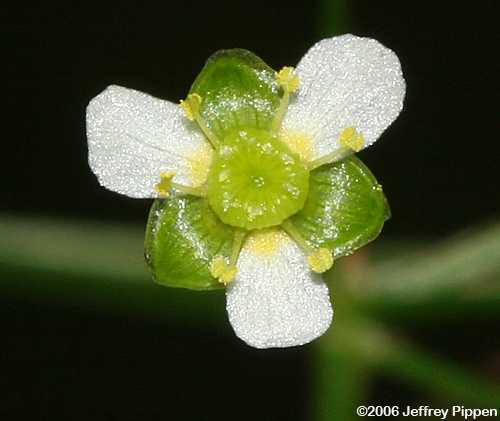 Flowers white, petals 3, about 0.2 cm long, 3 sepals, in widely branched, pyramid-shaped clusters, branches whorled, July- Aug.
Fruit dry, 0.2 cm in donut-shaped cluster above persistent sepals, dispersed into water in autumn. Alisma-subcordatum flower close-up. ©2006 Jeffrey Pippen. 060907-5083butnerz. Noorth Carolina Wildflowers Shrubs & Trees. jeffpippen.com (Accessed 7/2017). 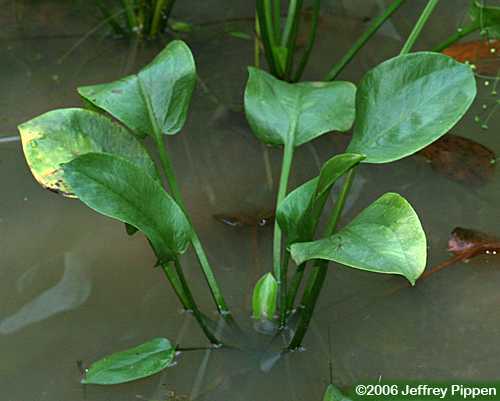 Habitat: Open sites in shallow water, pond edges, marshes; soil pH 5-7.